Lover Husband Father Monster is a story about family breakdown, written from two perspectives — that of the husband (Stuart) and that of the wife (Jennifer). What was your process for co-writing? Did one of you drive the project more than the other? And Elsie replied: “I don’t know, she just did!” Which of course is the sign of a good writer, when the characters suddenly start jumping around the page and doing things and heading in directions that were never considered in the original plot. This meant that I had to go back and re-write my latest offerings, but at the end of the day, it was an inspirational and intuitive move by Elsie. It changed the whole tenor of the book, gave us the opportunity to introduce new and colourful characters, and it made a much better work all round. Far better than my notion of the tired old Catholic versus Protestant thing that has been done to death. Still, I was brought up in that exact scenario, so I got to put down on paper a lot of turbulent mutterings, got them off my chest, felt much better about them, and them buried them in a drawer somewhere. I drove the plot when writing Jennifer’s tale, but it was a constant stream of discussion, questioning and revision. We wrote in blocks, about half a dozen chapters at a time before we stopped, took stock and moved on. We wrote twelve drafts before we were satisfied. You’ve self-published this book, but you’ve managed to get proper distribution and reviews in major publications. How did you go about doing this? With difficulty and doggedness. We used every resource available to us, writing to every newspaper in the country offering to send a review copy. We had two bookshops on our side — Just Books in Lakes Entrance and Dymocks in Southland. We had written other books and done signings for them so they were happy to have us back. For Lover Husband Father Monster we set aside twelve months and organized a writer’s tour for ourselves, going to every state. We wrote to other bookshops in the capital cities offering to do signings, most of which were very successful. One in Milton, Brisbane, was a painful three hours (we sold only five books), but at others we sold upward of twenty books. While we were in these cities we offered to do radio interviews and the country radio stations were fantastic. They were pleased to have a couple of eloquent writers talking about a social issue and welcomed us. We left books at country newspapers to be reviewed. They often took a photo of us with the book. If we were in a country town and the library was open we would donate a book. We spoke at Rotary, View, and Probus Clubs. We met a lot of people along the way and had a good year. Now Lover Husband Father Monster has to fly by the seat of its pants. 2012 and we are onto different things. Now that it’s all done and dusted, how has writing about family breakdown affected you as people? I must admit, when we jointly determined how the book would end, and I wrote the first version of the chilling climax, I pushed the chair back and thought, “Wow, did I just write that?” Even simply doing that had an impact on our lives. And promoting the book and getting readers’ views has elicited scores of responses from people who have personal tales of marriage breakdowns. One of the more unsettling angles is grandparents telling us how their son or daughter’s marriage is broken down, and how one of the parents is mentally unstable, and how they fear for the lives of the grandchildren. We hear a lot of haunting real life stories like that and it can affect you. We enjoyed working on a common project. 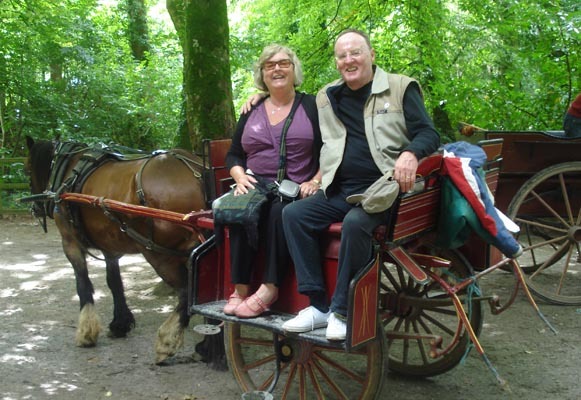 At times it was challenging separating real life from what we were doing but we were in Ireland so took the opportunity to travel into Europe, so our writing and involvement in the book was broken up by playtime and so it didn’t get to us. Last week we celebrated 40 years since we married in a country church so we shall probably finish the journey together. It’s been fun. Has it changed your relationship? 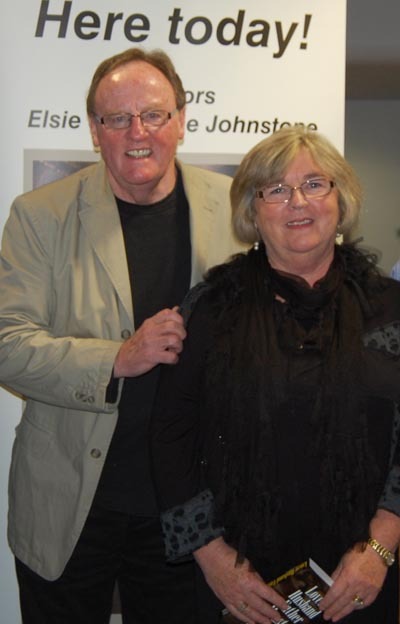 What’s next for Elsie and Graeme Johnstone? A lot of people ask us when the sequel is coming out. We never, ever in a million years considered there would be anywhere further to go with Lover Husband Father Monster, not after an ending like that. But those comments have made us sit up and think about it. At the moment, I have veered away from books into writing musicals. The first of these is being premiered in December. It’s called Normie and it examines the experiences of Normie Rowe, the former King of Pop, who was controversially conscripted and sent to Vietnam, only to come home and find that his stellar career had crashed. Normie will be in it, although not as himself. We have written a special part for him and composer Peter Sullivan and I have written five brand new songs for him. It’s a big project and we have a young director, Simon Eales, pulling it together. We have already had an ensemble cast do a rehearsed reading before an audience and the early signs are very encouraging. Me? I’m writing a novel called Ma’s Garden, the story three women, set against the backdrop of the first twelve months of operation of a country newspaper in Trafalgar, Gippsland, in 1902. It is about a small town at the edge of settlement. Also I have begun writing short stories. Last month I was awarded second prize in the Stringybark Short Story Historical Writing Competition for a piece entitled “Footsteps in the Dark”, set in Melbourne during WW2 and the brownout. My thanks to Graeme and Elsie for being so generous with their time and answering my questions. To find out more about them and their writing, check out their website. Next Next post: Review – Seen Art?